I’m on the fast train from Madrid to Barcelona, travelling through the heart of Spain. Miles and miles of stunning countryside bathed in Spring sunshine flash past the window as we cruise along at close to 300 kmh. The snow-capped Pyrenees are visible in the distance. Quite apart from the fact that catching the fast train in Spain makes anything to do with rail travel in the UK look distinctly 3rd world, it’s also a great way to see a bit of “real Spain”. 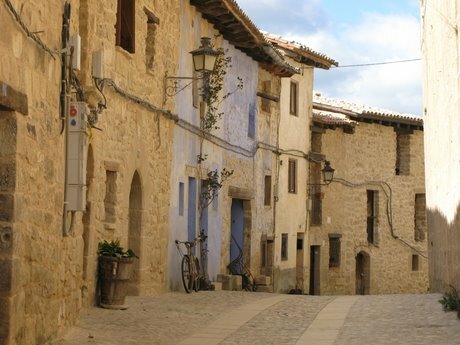 Many British people who dream of moving to Spain – and there are still a lot of them – claim they want to live in the “real Spain” but few of them actually go anywhere near it. The route of this train crosses 620 kms of Castilla La Mancha, Aragon, and Catalonia, almost half the country. It couldn’t’ get more real, and only takes 2 ½ hours on this sleek, modern train (€240 return first class). Every now and then you pass a city with chicken-coops of new developments on the outskirts, but most of the way it’s just attractive countryside, with traditional towns dominated by the ubiquitous church. Drive down the coast and you get the impression that Spain is covered in new developments, but go deep inland and you realise that it’s just not the case. And though prices all over Spain have risen in recent years, in these parts property is still cheap, relatively speaking. The main problem you might have is finding what you want given the limited housing stock. From what I can tell from the train, and from what people have told me, it’s either a village house or a fairly basic traditional farm house. No Marbella-style villas around here, if that’s your cup of tea. That said, once you get into Catalonia, you start seeing some nice piles. Another problem you might have is finding an estate agent, or anyone for that matter, within a hundred miles who speaks English. But that’s the way it is in “real Spain”.